The Feisol Tournament CT-3442 is the best tripod ever made–at least in my opinion. I've owned about a dozen “professional grade” tripods over the last several years and all of them have had their benefits and drawbacks, but the Feisol is as close to perfection as I've found. In short, the Feisol is incredibly lightweight and compact while being very stable and durable. I'd recommend this tripod for any photographer who values a lightweight and compact tripod but needs a sturdy enough platform to do professional photography work, and is willing to pay for it. The Feisol weighs in at only 2.31 pounds (1.05kg)! That's incredible for such a quality, stable tripod. In fact, I talked with a representative from Really Right Stuff and asked them if they had anything comparable to the CT-3442. They don't make anything even close to this weight. It can be tough to put the weight of the tripod in perspective without comparing it directly to other similar high-end tripods. 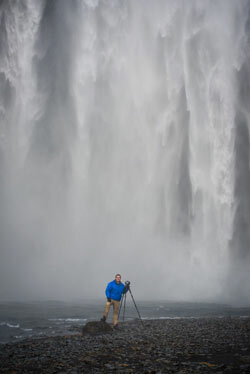 I got my Feisol SOAKED this day while shooting waterfalls in Iceland. I should probably clean out my tripod after I get it sandy and salty, but I never do. It's tough as nails. I abuse tripods. I've dunked my Feisol almost completely under water to get an interesting perspective shooting from in a river up at a waterfall, used it in salt water, got it covered in sand at sand dunes, brought it on many airplanes, etc. But the tripod still works like new for me. The only durability issue I've had is that after about 6 months, the small rubber feet on the end of the tripod legs popped off one-by-one. So I'd recommend dabbing a little glue around the lip of the feet when you get the tripod to keep that from happening. Other than that, I've had no issues whatsoever. If you do have any issues, Feisol offers an excellent 3 year warranty. That shows a confidence in their product that very few other companies have. The tripod reaches 54.5″ (4′ 6″) or 140cm without the optional center column. 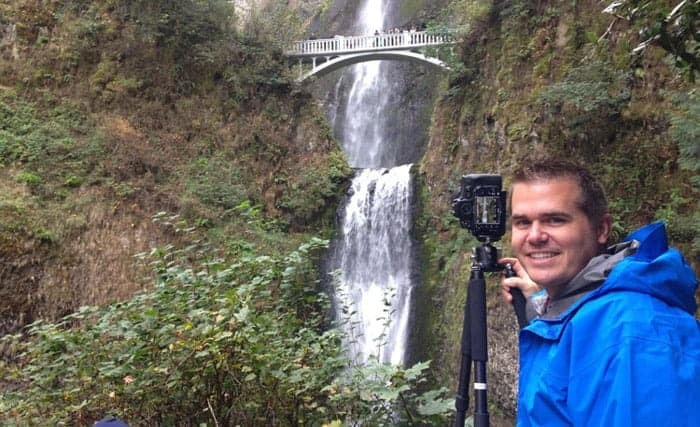 That may seem short for an average-height adult male until you realize that a tripod does not need to be as tall as the photographer to reach a comfortable shooting height. I'm an average height for a guy. I'm 5′ 10″ (178cm). However, my eye line is shorter than the top of my head by about 6″ (15cm). Also, the ballhead adds another 6″ (15cm). Then, you add another inch and a half from the bottom of the camera and a half inch from the quick release plate. When you do all of the adding, you'll find that this tripod will actually bring the camera to a height just slightly above my eye line. So this tripod is plenty tall for most photographers. I usually don't extend the legs all the way for it to reach my eye line. I'd say this tripod will do well for any photographer 6′ 1″ (73cm) or shorter. Getting a tripod that will comfortably reach your eye line is important for your comfort while shooting. As I travel around to do workshops with readers of Improve Photography around the world, I find that the majority of photographers don't pay attention to the height of the tripod when buying, and end up with something too short. 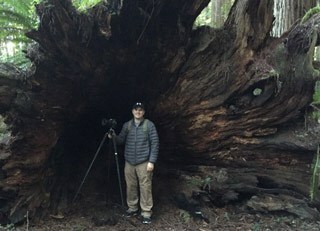 Same tripod, but now shooting in the Redwoods. Some people pose in pictures with their spouse, but I pose with my Feisol (don't tell Emily). Before switching to this Feisol, I used the incredibly robust and solid Induro tripods. After using the Induros, I wasn't ever sure if I could switch to a lightweight carbon fiber tripod because I was concerned about the stability. I was wrong. I've never had any issues with the stability of my Feisol. Being a lightweight tripod, it is possible you'll find a situation where the wind simply blows the setup, but this has only happened to me a few times. When the wind blows the tripod, some photographers attach a camera bag to the tripod to weigh it down, but I usually find that the bag swings in the wind and makes the movement worse. The best solution I've found is to simply position myself in front of the tripod as a windbreak. But again, I've probably only had to do this twice in the last several years, and both times were in hurricane force winds. My one complaint with this tripod is that the primary leg angle is just slightly tighter than I feel that it should be. That makes the tripod just slightly more likely to tip over, but I've never actually had that happen. I wouldn't mind seeing the legs spread out just a tiny bit wider at the primary leg angle. That's me again! Shooting with my Feisol in Portland, Oregon. I'd consider the Feisol sturdy enough to handle almost any photography application. I've used it with extremely heavy full-frame cameras and lenses without issues, and I also use it regularly with my lightweight Fuji XT1 mirrorless camera. If I regularly shot professional wildlife or sports photography and was using 400mm f/2.8 or larger lenses, I'd probably choose a heavier tripod meant to handle the weight. I wouldn't be concerned about doing so sporadically, though. When I've used very heavy lenses with this tripod, I found that the legs spread out under the weight just slightly. Again, though, this only happened with the very heavy supertelephoto lenses. One of my favorite features of this tripod is that it has no center column. That means you can get the camera right down to near flat on the ground for an extreme low angle landscape, or for photographing flowers. 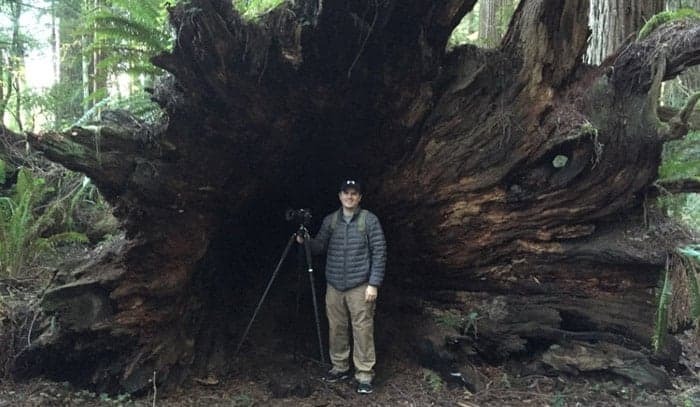 When you have a center column on the tripod, it keeps you from getting lower than a foot and a half from the ground, which is a major limitation for nature photographers. One problem, though, is that the base is quite wide. If you use a very compact ballhead for a mirrorless camera, the knobs can be obstructed by the tripod base. I use a Really Right Stuff BH-40 medium-size ballhead and the base does not get in the way. I'd love to see a slightly smaller base on this tripod. 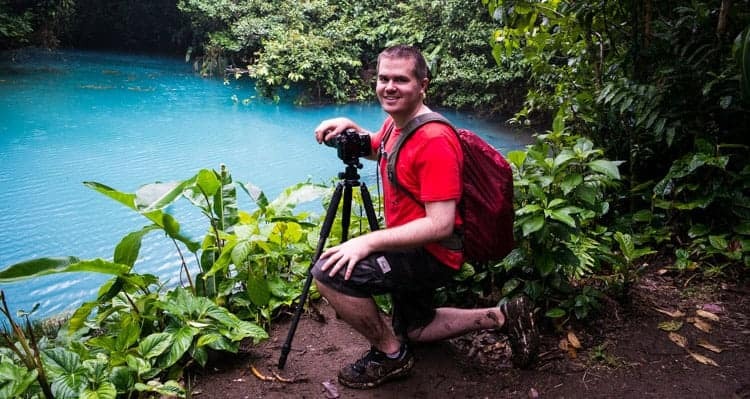 Same tripod (different ballhead this time) in Costa Rica. If you look at my shoes, you'll get an idea of just how muddy I got the tripod this day. Still works like a charm. This is a no-frills tripod. In the last few years, the tripod wars have really heated up, which has produced a number of innovative–and sometimes gimmicky–features in tripods. This tripod has none of them. None of the legs can be screwed off to be a monopod, it doesn't tilt to a 45 degree angle, it doesn't even have spikes. In a way, that's what makes this tripod great. This is a no frills tripod that does the basic stuff perfect. But it does have one innovative feature. The legs of the tripod can flip up over the head so that the overall length of the tripod and ballhead can be reduced. That's really nice when you are putting the tripod on a bag for travel. You can check the current price of this tripod on Amazon. I buy all of my camera gear on Amazon for their fast shipping, easy return policies, and great prices. If you decide to buy this tripod, please click the link to Amazon above before you buy. I get a very small commission on the purchase, and it doesn't cost you an extra penny. It's a great way to support the site. I will note, however, that we get the same commission no matter what products we recommend or review. That means we can be completely unbiased in our reviews and still have the funds to continue creating this resource for photographers.